AnyMP4 BD to MKV Backup 6.0.30 無料ダウンロード - Copy Blu-ray to MKV without any loss and remain high quality. AnyMP4 Blu-ray to MKV Backup is the most wonderful Blu-ray to MKV Backup software, which is used to backup MKV from 2D or 3D Blu-ray disc without any quality loss. Also, this wonderful program allows you to delete your unwanted audio tracks and subtitles from the original Blu-ray disc and retain your needed ones when you copy. And you can enjoy the created MKV file on the computer or some video player devices. Meanwhile, you are able to take a snapshot of the pictures you like. AnyMP4 Blu-ray to MKV Backup allows you to copy 2D or 3D Blu-ray disc to MKV file without any quality loss and it has fast copying speed. Also, you can remain the audio tracks and subtitles of the Blu-ray disc. And the output MKV file is totally the same with the Blu-ray. This AnyMP4 Blu-ray to MKV Backup enables can choose your preferred audio tracks and subtitles of the original Blu-ray disc, and then make MKV file with the 2D or 3D Blu-ray disc. Certainly, you can uncheck your unwanted audio track and subtitle. 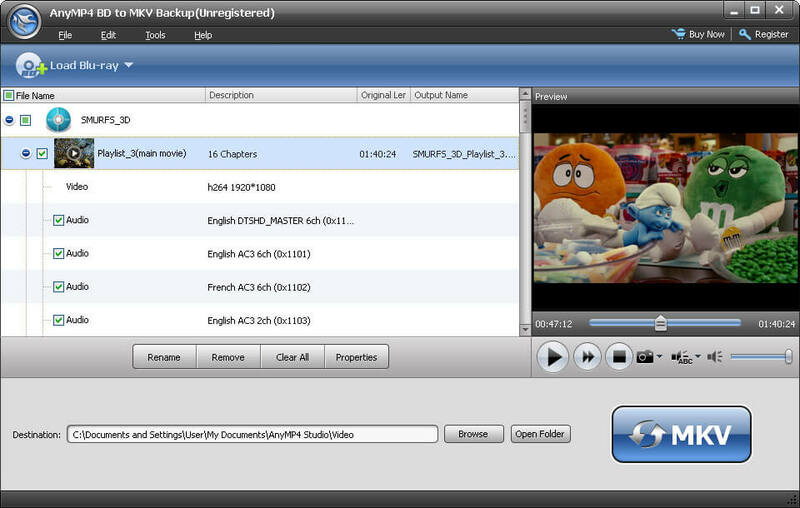 This Blu-ray to MKV Backup software has an intuitive interface, and you can easily handle it. Especially it provides a built-in player, which can help you preview the video clearly. Besides, it provides four kinds of languages to choose. As for the output file, you can select the storage path. In a word, the Blu-ray to MKV Backup software will be a good helper of you.